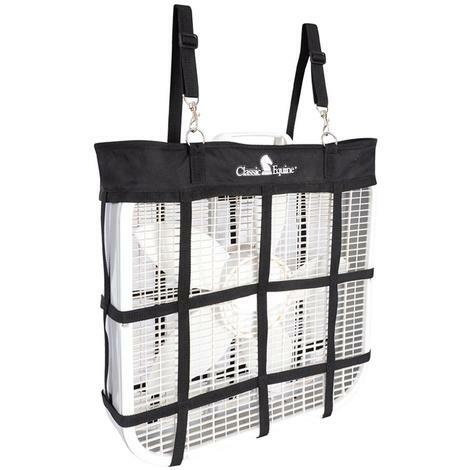 Made of tough 420 denier nylon with PVC mesh pockets that allows dirt to escape. Nylon straps with buckles and rings allows case to be hung anywhere. Perfectly sized pockets, each with an elastic gathered top that secures items firm, yet makes them easily accessible. 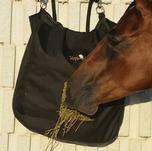 Size 42"x42"
This Classic Equine groom tote bag is made of tough poly material for durability. It features a padded shoulder strap for comfortable carrying, and multiple mesh pockets on the front and side for easy access to accessories. 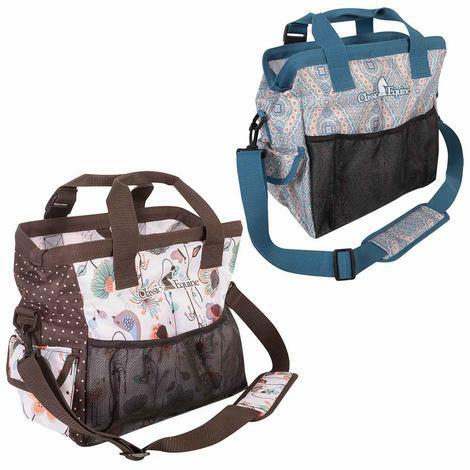 This stylish bag boasts plenty of storage space for extra items such as a phone, water bottle, or your favorite book. 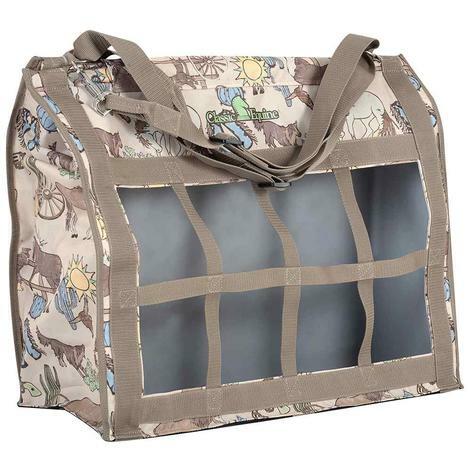 This boot accessory tote is the perfect size for carrying your horse's essential items. 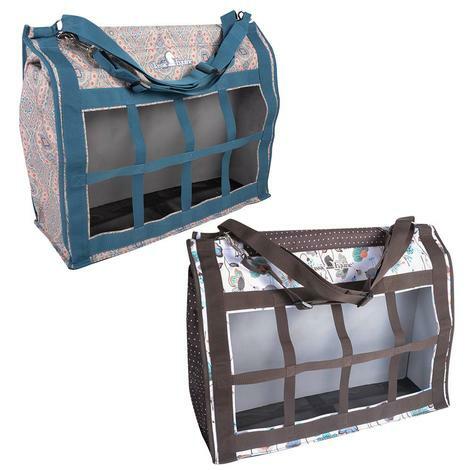 This tote is designed with convenience in mind, it has mesh on both sides as well as the bottom to allow odors and dirt to escape as well as for your splint and bell boots to air out. There are a total of 6 pockets that vary in size to hold anything from your cell phone to your water bottle or keys. 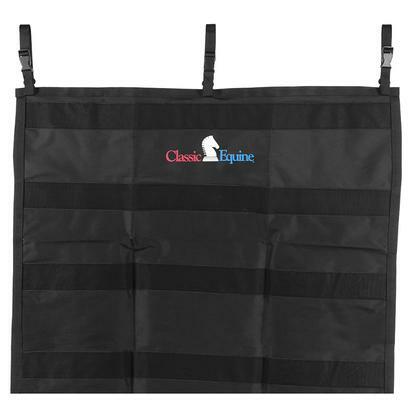 The Classic Equine top load haybag is an extra large bag made of durable poly. It features a top flap that velcros shut, webbed front squares, a large adjustable strap, and a mesh bottom. 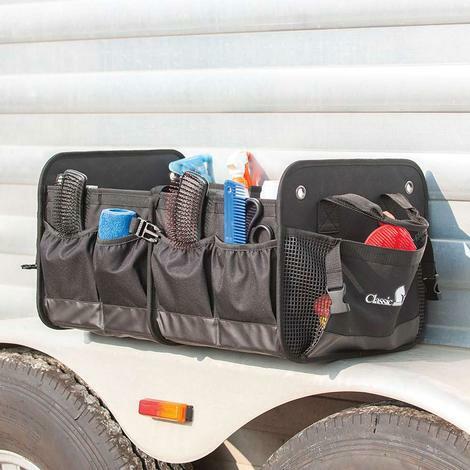 The Classic Equine foldable trailer organizer is designed to keep all your grooming, first aid, dressing, feeding, and otherwise neat and in order while traveling. 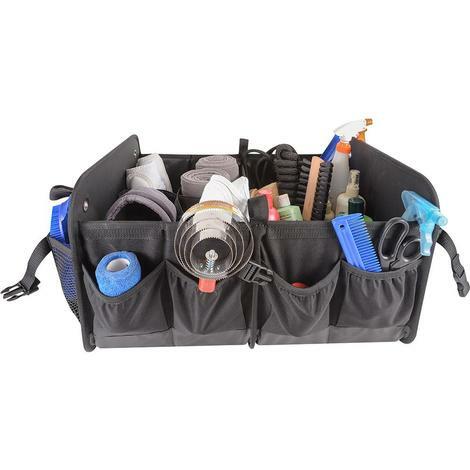 This very keen black tool is 4-pocketed on each side with elastic tops to hold your stuff in. 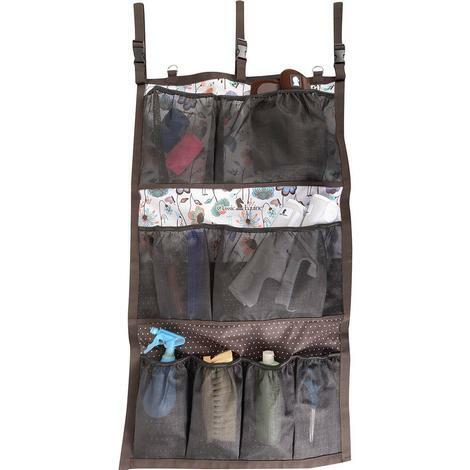 Each end is pocketed with mesh sides for wash tools that might be damp and also includes 2 grommets per end to attach bungee cords or ties to keep it stable. The insde is divided to keep bottles, brushes, bandages, etc. upright and in the stay put direction. 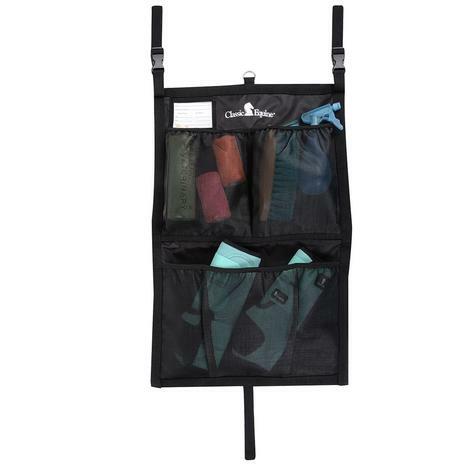 The whole organizer collapses and fold down to a stowable size and secured with quick buckles. Very handy for travel, trailer, or stall. 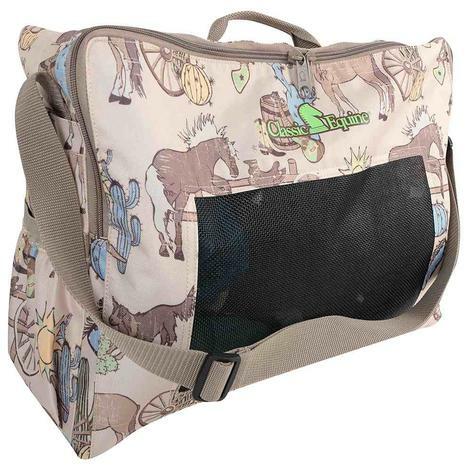 This Classic Equine groom tote bag is made of tough poly material for durability. It features a padded shoulder strap for comfortable carrying, and multiple mesh pockets on the front and side for easy access to accessories. 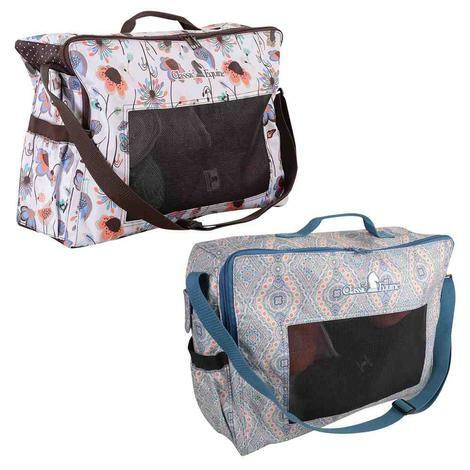 This stylish bag has an adorable frontier print and boasts plenty of storage space for extra items such as a phone, water bottle, or your favorite book. 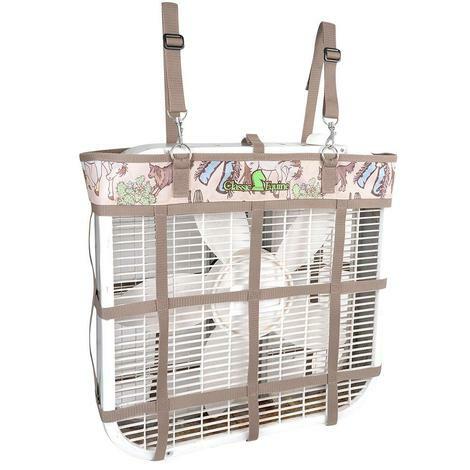 Secures standard 20” x 20” box fan to stall. 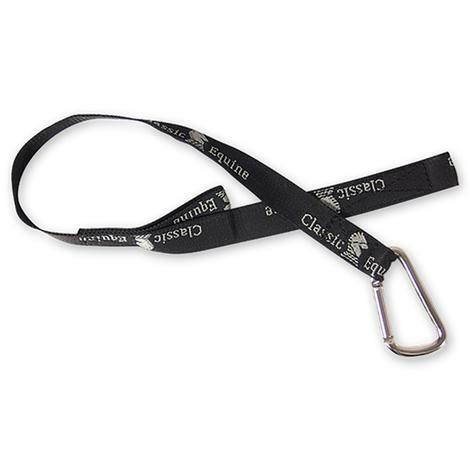 Sturdy nylon webbing resists horseplay. Lightweight and portable. Space saving design. 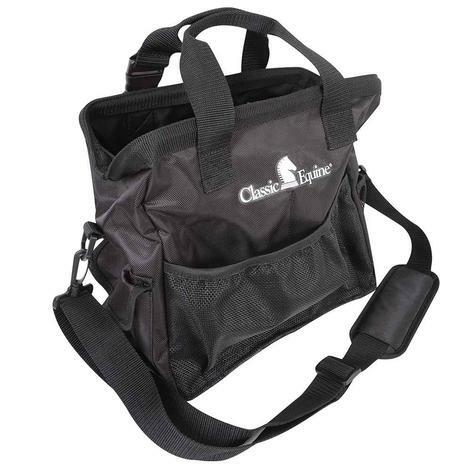 The Classic Equine stall front hanging bag is great for traveling with your horse. Features mesh pockets and an ID card/card holder. Easily folds up for travel. The ID card is great for displaying horse and emergency information. 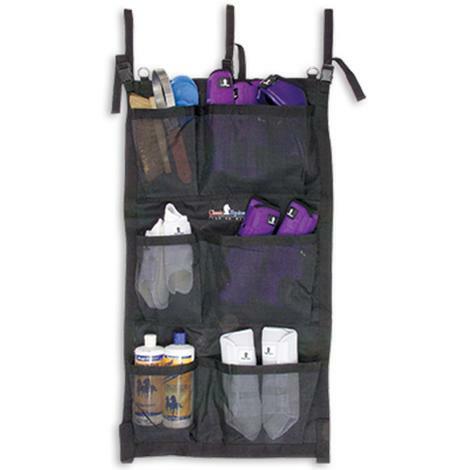 The Classic Equine hanging groom case is excellent for storing grooming tools, sprays, boots, and more! Features mesh pockets, elastic- gathered pocket tops, and nylon straps with buckles and rings. Available in three different styles. 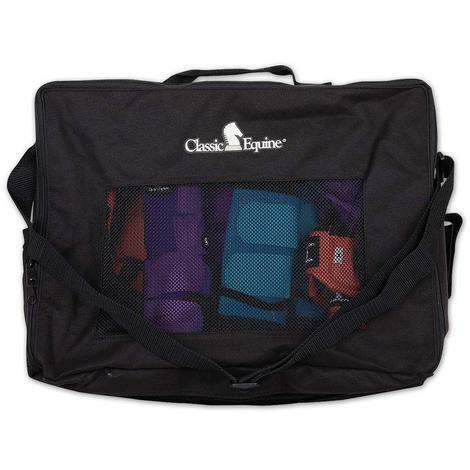 Classic Equine deluxe groom tote made of tough nylon. Has multiple pockets on the inside and outside. 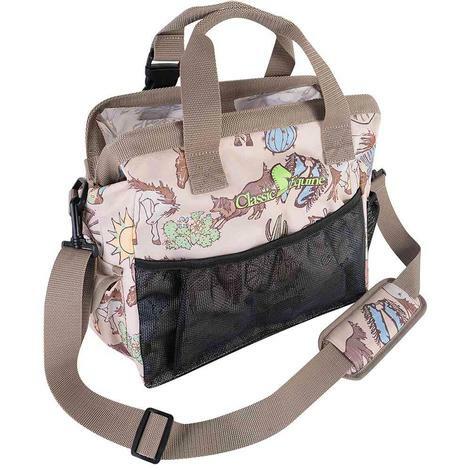 Features a nylon shoulder strap for easy carrying. Available in three different styles. Improved smaller opening and top closure help eliminate waste. Double snap attachment prevents twisting and spinning. 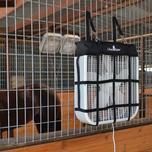 Washing horse boots is easier with this clever Classic Equine Hanging Wash Rack. 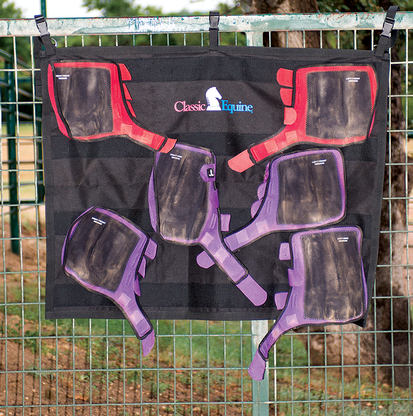 Four rows of hook-and-loop material keep multiple pairs of horse boots secure for washing, then allow them to dry quickly. 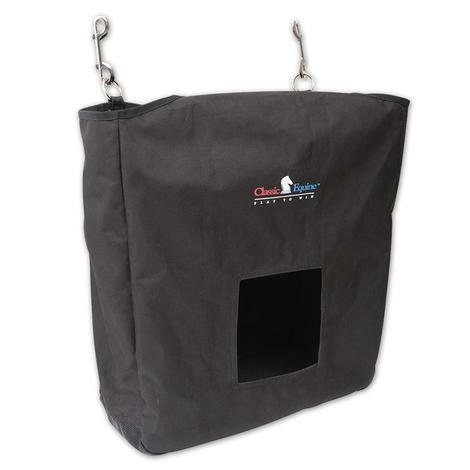 In durable nylon that stands up to many washings and with three adjustable straps for hanging. Tough 420 denier nylon shell with PVC mesh sides and bottom to allow dirt to escape in great colorful designs. 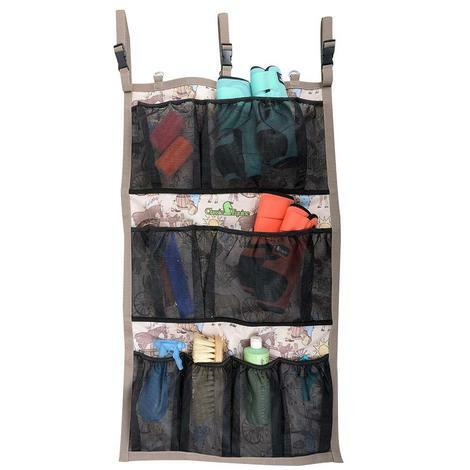 Six pockets of various sizes on sides for cell phones, water bottles, etc. Double zipper closure.